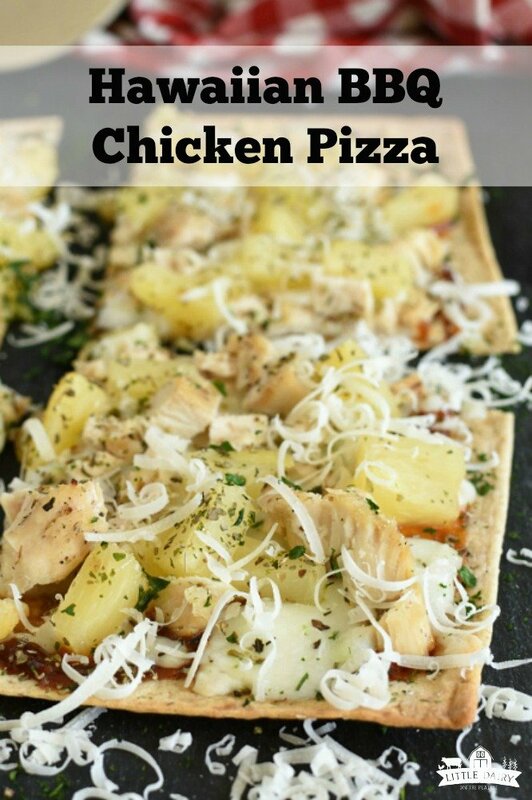 Hawaiian BBQ Chicken Pizza makes a super quick and easy weeknight dinner; it only takes about 5 minutes to make, can be baked or cooked on the grill, and uses leftover grilled chicken! 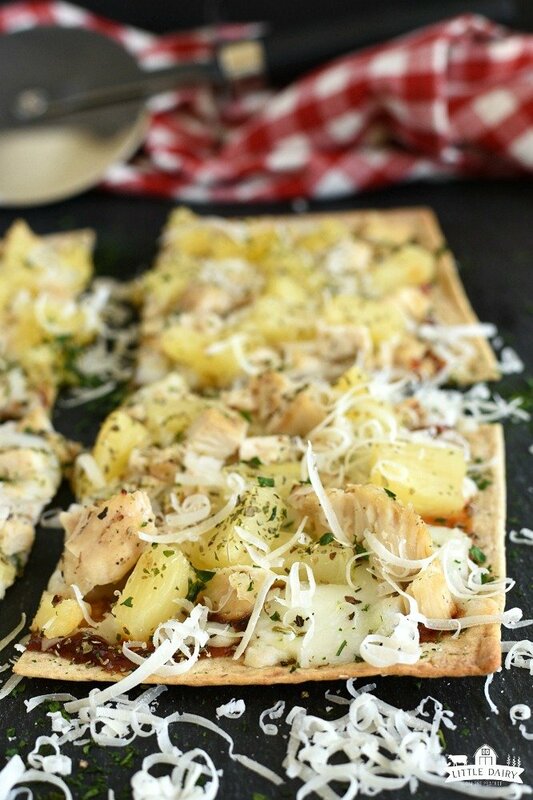 Use a flatbread crust to make it even easier! Everyone in the family will go crazy for this pizza! Remember when I shared The Best 3 Ingredient Grilled Chicken Recipe with you? In that post I suggest grilling up extra chicken to have on hand for creating quick and easy meals later on in the week. I’ve always been a huge fan of cooking extra meat and then repurposing it into new dinner ideas for the next couple days. It is such a time saver and I’ll take all of those I can get! Grilling chicken ahead of time and having it ready makes throwing lunch together a breeze. 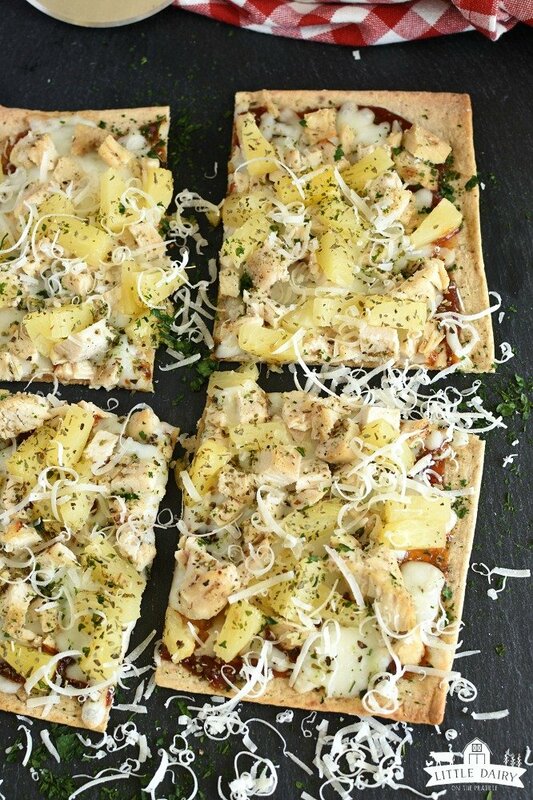 It’s perfect for throwing on a pizza crust and turning into Hawaiian BBQ Chicken Pizza. Summers on the farm are absolutely crazy! Everyone is headed a different direction all day long, and usually half of the night too! Our kids are an important part of our summer crew. How well the harvest goes depends on the weather, and how many equipment breakdowns we have to fix. When things are going well we cross our fingers and run as fast and hard as we possibly can. We start early, quit late, and we don’t lunch breaks. The kids have to turns coming home for lunch or I have to deliver it to the field. Summer meals have to be quick and easy, or something that can be microwaved. Sometimes I beg for just one or two meals of us sitting down at the table and catching up with each other, but I guess I’ll just enjoy the one on one time I get when I deliver meals to the boys in the fields. Varieties of pizza that can be made into a flatbread pizza. The other day I made Chicken Taco Pizza and Hawaiian BBQ Chicken Pizza for lunch. You can check out all my tips for choosing a crust, baking or grilling the pizza, and assembling it HERE! Here are a few other kinds of pizza you try. Why use a flatbread for pizza crust? 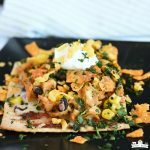 Flatbread is obviously a super easy option because it’s already made and all I have to do is throw it on a baking sheet and pile my toppings on there! It’s perfect for last minute meals because you don’t have to make pizza dough, wait for dough to rise, or wait for it to bake. 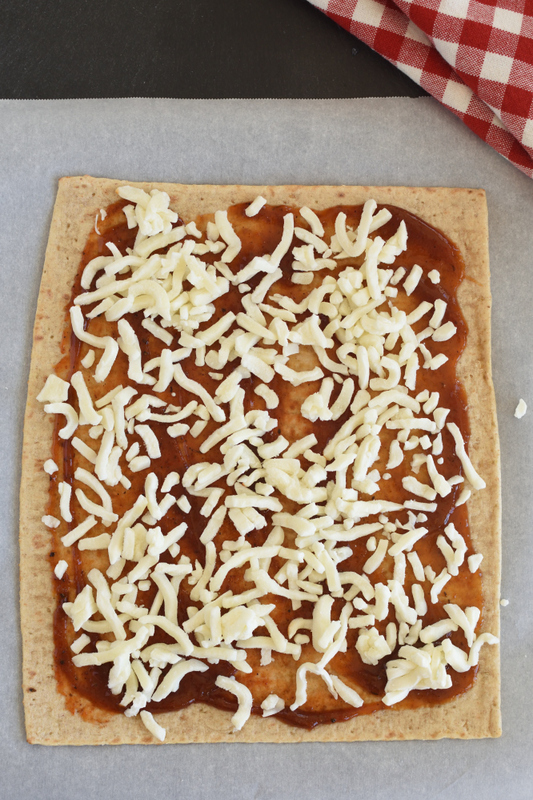 Flatbread pizza is ready as soon as the cheese is melted through because the crust is already baked. It’s so fast! 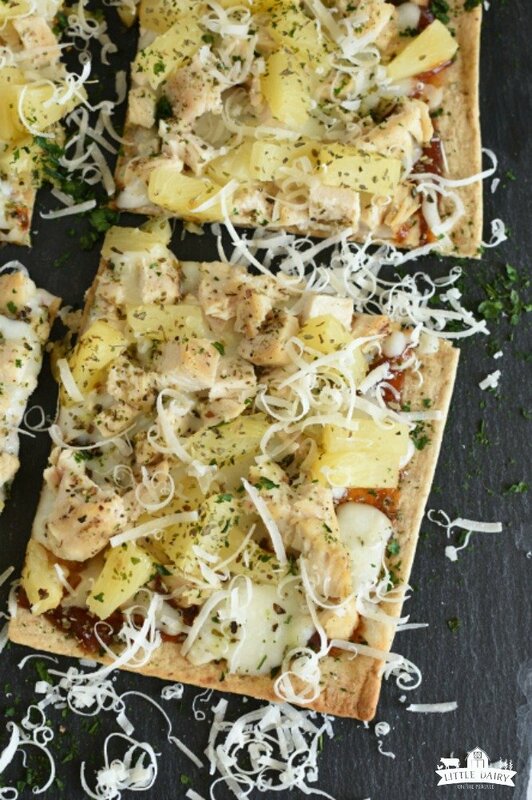 Flatbread keeps quite a while, especially if you keep it in the fridge. I also throw it in the freezer sometimes because I live so far from the grocery store and I never know when I’m going to be back. Yes, I stockpile food! Assembling the pizza is easy! Basically all you need to do is spread some sauce over the crust. I used Homemade BBQ sauce I had leftover from the other day. Add a hearty layer of grated cheese. You can use any kind you like. I used mozzarella because it’s classic pizza cheese and you can’t beat the way it melts! Sliced provolone would be awesome too! Like I said if you already have leftover grilled chicken in the fridge you can move on to adding diced chicken without even having to mess around with cooking chicken. If you haven’t tried grilling extra chicken when you make it for dinner you’re causing yourself more work. It’s so easy to just grab it out of the fridge and throw it right on there! After grilling it I even dice it or slice it before I put it away. It’s totally ready to go! Throw a little pineapple on top and stick the whole thing in the oven! Let the pizza rest for a few minutes before cutting it into pieces. The pizza is pretty drizzled with a little extra BBQ sauce. It’s pretty and yummy with parsley and grated Parmesan cheese on top too. Fancy it up anyway you like, or eat it exactly as it is! Either way it will be a hit! My boys don’t love veggies as much as I do, but I love adding a relish tray or a salad with my pizza. If my boys, except Branson, have Dilly Dip they’ll devour veggies. 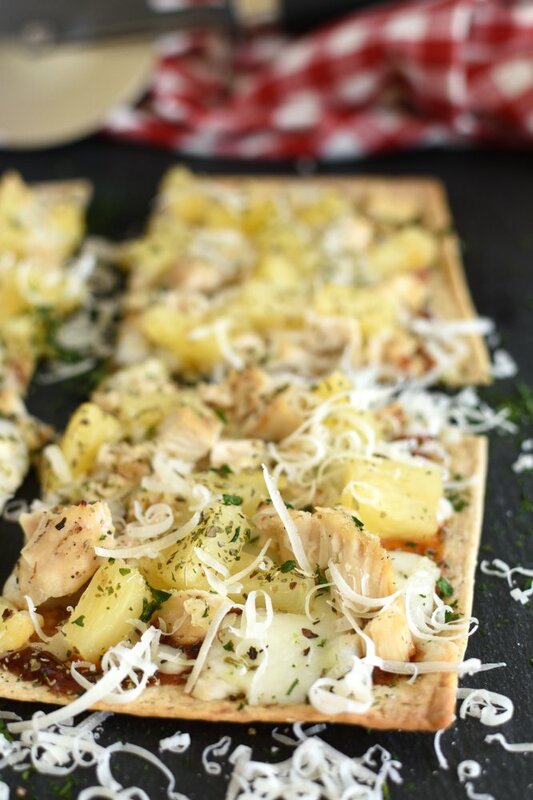 Add this super easy and incredibly tasty pizza to your menu this week. If you fly by the seat of your pants like I do and don’t have a menu, keep it in the back of your mind for those days when you need a meal in less than 15 minutes! Now, I’m off to deliver lunch to the tractor! Well, not to the tractor exactly, but to the kid driving the tractor! Grab the printable recipe here! 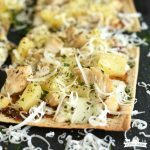 Hawaiian BBQ Chicken Pizza makes a super quick and easy weeknight dinner; it only takes about 5 minutes to make, can be baked or cooked on the grill, and uses leftover grilled chicken! Move rack to center position in oven and preheat to 400 degrees. Or preheat grill to about 400 degrees. Set flatbread on a parchment lined, or greased, baking sheet. Spread barbecue sauce to edges of flatbread. 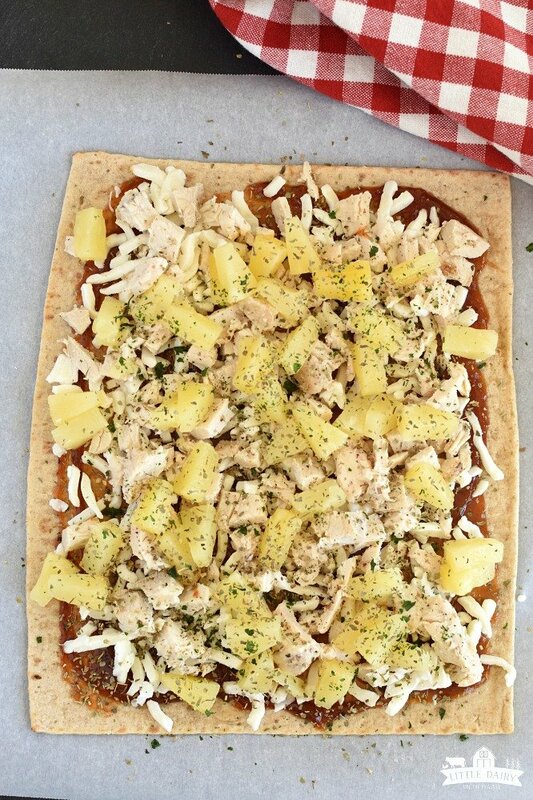 Add grilled chicken and pineapple. Remove from oven and let rest for a couple minutes. Garnish with grated parmesan cheese and chopped parsley if desired. Serve with additional barbecue sauce or ranch dressing. I completely agree with that! That would be a dream come true! Wow – you go through a lot over the summer! How fab that you can get a tasty meal together so quickly for the hungry family! This is a great dish! Well, that’s how we expect your summers to be! 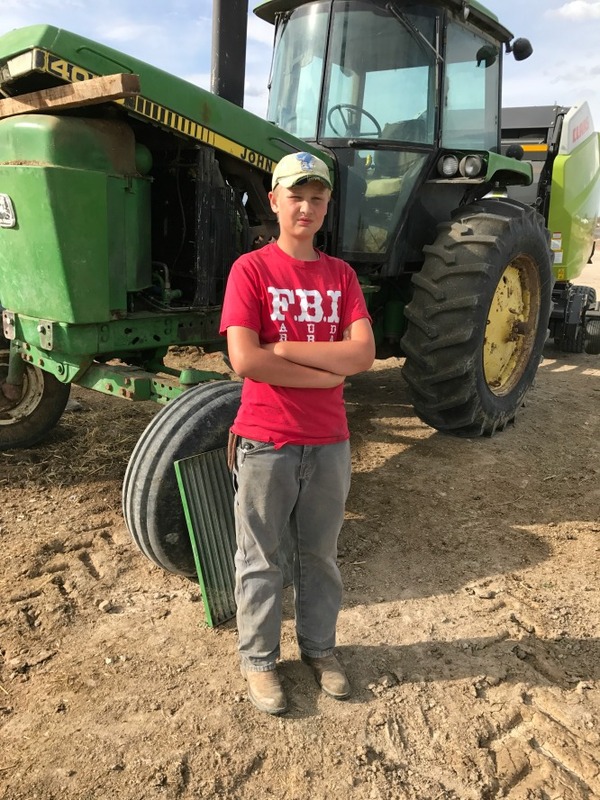 My kids love it and want to be farmers when they grow up even with all of the long hours and challenges! Like all boys, mine get hungry quick and need lots of yummy food to fill them up! Enjoy! This looks amazing! I love Hawaiian flavors! It’s my hubby’s favorite pizza! It’s even better with leftover grilled chicken! Mmmmm! Easy is always super important for crazy families! And eveyone goes crazy for pizza! 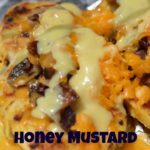 My husband loves pineapple on this pizza so I know he would love this one. I may have to make it for him for his birthday! My hubby does too! Happy birthday to yours! This is such an awesome idea! 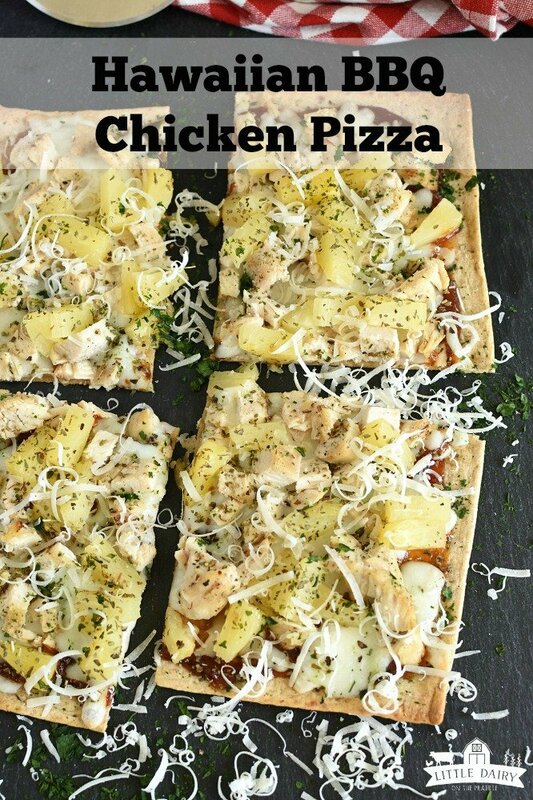 I will definitely try this for our next pizza night! 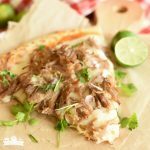 Since it’s so easy to make it would be perfect for pizza night! Enjoy! You can’t go wrong with sweet, juicy pineapple! 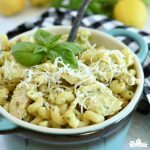 Add a little grilled chicken and it’s even hearty enough for my hungry guys! Enjoy! This pizza needs to happen at my house very soon!! Yesss! It’s so easy, and easy happens to be my go to every night of the week!